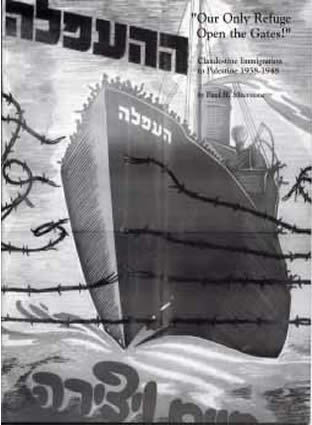 Sustained by the Zionist dream and spurred by the threat and later the unrelenting actuality of Nazi annihilation, 125,000 Jewish men, women and children made the perilous journey by sea to Palestine during the period 1938-1948 despite the many obstacles placed in their way. Paul Silverstone’s work highlights the many ships that brought the refugees to Palestine against adamant British opposition which landed many in internment camps. Before the outbreak of World War II, the original driving force behind clandestine immigration was the Revisionist movement which operated according to its own agenda, a policy contrary to that of the Jewish Agency and the ‘establishment’ opinion of Jewish Palestine. After Munich, the newly formed Mossad l’Aliyah Bet, formed by the Haganah, the military arm of the Jewish Agency, joined in the rescue effort. The British policy relating to the admission of Jewish immigrants to Palestine also changed with each period. Often it took a tragic episode to cause such a change. The sinkings of the Patria and Struma, and the forcible return of the Exodus passengers each resulted in a modification of British policy. After the war the cycle began again, small vessels holding hundreds of people giving way to ever larger vessels carrying thousands. Some 75 ships were used in this endeavor. Highlights the many ships which brought Jewish refugees to Palestine before, during and after World War II. This dramatic movement of people, known as Aliyah Bet or secret immigration, was made more significant because of the constant opposition of the British government which administered Palestine. 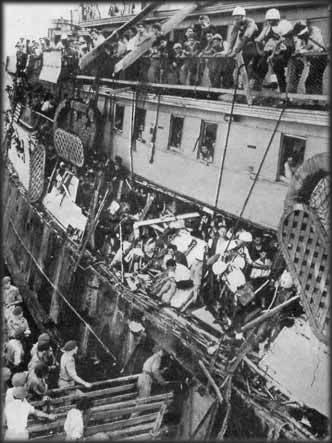 Some perished when ships sank but most made it successfully to the Jewish homeland. Before the outbreak of World War II, the original driving force behind clandestine immigration was the Revisionist movement which operate according to its own agenda, a policy contrary to that of the Jewish Agency and the ‘establishment’ opinion of Jewish Palestine. After Munich, this opinion changed and the newly formed Mossad l’Aliyah Bet,organized under Haganah the military arm of the Jewish Agency, joined in the rescue effort. In Vienna Adolf Eichmann was attempting to force Jews into emigration, while the British White Paper was severely limiting Jewish entry into Palestine. Nevertheless, British policy relating to Jewish immigration changed from year to year. Often it took a tragic episode to cause such a change The sinkings of the Patria and Struma, and the forcible return of the Exodus passengers each resulted in a beneficial modification of British policy. During the period 1938 to 1942, small, old tramp steamers were chartered to carry refugees desperate to escape Nazi persecution. Small auxiliary schooners with a few hundred people give way to larger vessels carrying thousands. After the war the cycle began again, small vessels holding hundreds of people followed by larger vessels carrying more people per square foot. Against these refugees were deployed all the weapons of the British Empire, diplomatic, legal and the Navy and Army. Following the end of the war and the revelation of the Holocaust, the involvement of Americans became important in the story. Hundreds of American volunteers manned ten ships which brought in over half the total for the period 1946-48. These ships which include the Exodus area vital part of the story and the volunteers a part of the living history of Aliyah Bet. The author met with many of these men at their 50th reunion held in Haifa, Israel, in May 1997. He also spoke at the annual memorial service held at West Point that year by the American Veterans of Israel. Recently he met with David Stoliar, the sole survivor of the Struma disaster. 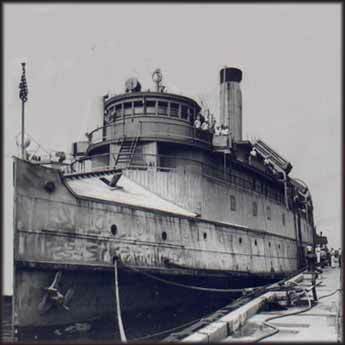 USS PRESIDENT WARFIELD in naval service, which later became the Aliyah Bet ship Exodus.